Happy new year everyone! I know I’m a bit late to the party, as we are already almost at the end of the month, but as this is my first post in 2018, it seems appropriate. I had major changes in my life toward the end of 2017, and so as we were heading into the new year, I put alot of thought into what I hope to accomplish in 2018. I am feeling very optimistic (which wasn’t the case for much of 2017), and I think it has to do with taking more time than I usually do to make plans for the new year. My major focus in setting resolutions, if you want to call them that, was thinking about what HABITS I wanted to either break or form. I didn’t want to set short-term goals like “Lose 10 pounds” or “Run a 5k”. I wanted to focus on forming habits that would help me accomplish long-term, ongoing things like “Get better at drawing” and “Be healthy and more energetic”. I bought this book over a year ago, but when I started it last New Year’s, I had to give it up because I didn’t feel inspired by the exercises AND it was taking up too much of my day. But a few months ago, when I was browsing the clearance section at Hobby Lobby, I found this book about mandalas, which have always appealed to me. 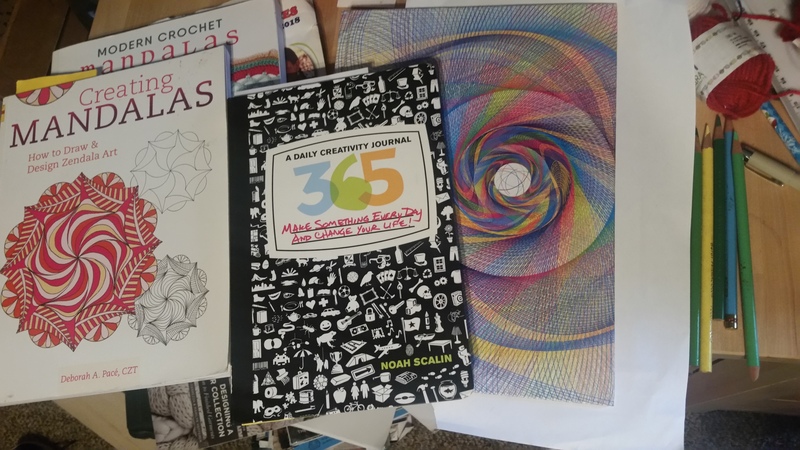 I realized that mandalas would be the perfect theme to use to work through the daily art book. The result is that so far, I have spent 30 minutes daily practicing creativity simply for the sake of enjoying it but will not have a finished piece every day. I am focusing on what inspires me in the book and skipping over what doesn’t. You can see what I’ve produced in my updates here once a week, but if you would like to keep up on a daily basis, follow me on Instagram! This is also about habits. I have a few habits I’m trying to break for this one, namely, consuming less alcohol and sugar. Sugar is just bad all around, although I don’t think I’ll ever be able to give up chocolate. But being more controlled about it and eliminating added sugars in food will help. And alcohol… what can I say, I love a good glass of wine with dinner at night. But I noticed that it affects my sleep patterns, and all the articles I’ve read lately about health and having more energy, losing weight, etc., all say that alcohol is to be avoided. So I am trying to form the habit of drinking more water and saving a glass or two of wine for the weekends. The other health-related habit I’m working on is exercise. This habit is already partially formed, but I would like to cement it in as part of my lifestyle in 2018. I used to be a runner but have had alot of pain when running after breaking my ankle a few years ago. I have tried a number of different workouts – circuit training, which makes a huge difference but is such a CHORE, and Zumba, which is cardio all the way but is the most fun I’ve ever had exercising. I’ve had a hard time sticking with anything since I stopped running, so I decided to do the same thing I did with creativity – commit 30 minutes a day to exercise and not worry about getting “in shape” for anything. So far, I’ve been able to maintain the habit, although I have to admit it is always in the back of my mind to be able to run again. And my final habit is reading for an hour a day. Committing an hour has been difficult on some days, and so I have broken this one a few times. But 30 minutes to get into a book didn’t seem like enough time, which is why I set the goal at spending an hour a day, minimum, for reading. An hour is usually doable, and is a long enough timeframe to get through some of the book. Again, I am focused on setting the habit of reading, and so I am trying not to put too many parameters on the habit. Some days I feel like reading a novel or a fashion magazine, and other days, when I’m not exhausted at bedtime but reading earlier in the day, I study a knitwear design book. I don’t always look forward to, or enjoy, exercising, but this habit is pure enjoyment for me, regardless of what I’m reading. So let me know, my friends, what are you doing in the new year? If you have resolutions, share them in the comments, and if you want to join in doing something creative every day, whether it is cooking or drawing or whatever else, please post your photos on Instagram to #createwithelizabethkaybooth. Happy 2018 to you all! Will You Join Me in Joining a KAL? These all sound like worthwhile resolutions, Elizabeth, particularly the one for thirty minutes of daily creativity. I find that when I feel upset, leaving the situation to create some art destresses me. My three main resolutions are daily journaling, taking more time in the day to relax (I’m a go-go-go person), and engaging with the Bible more often.